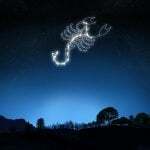 The Scorpio Constellation is one of the twelve constellations of the zodiac and there is a myth that relates it to the huntsman Orion. According to Greek mythology, Orion grabbed of being able to hunt and kill any creature on Earth. Artemis, the goddess of the hunt, and her mother Leto decided to punish Orion by sending to Earth a giant scorpion that would find him and kill him for his arrogance. The scorpion fulfilled its mission on Earth so Zeus, the god of the gods, gave the creature a place in the sky, located right in front of the constellation of Orion. Another version of the myth tells that it was the god Apollo, twin brother of Artemis, who decided to punish the mortal Orion for believing that he was a better hunter than the goddess Artemis herself. One can still look up to the sky and watch the Scorpio constellation on the horizon, while at the same time, the constellation of Orion appears to the east. The constellation of Scorpio has always been one of the most observed constellations in the night sky because of its brightness and its easily identifiable shape. In the northern hemisphere, Scorpio is close to the southern horizon and is a constellation that can be observed more clearly in the summer. In the southern hemisphere, Scorpio is very close to the zenith (vertical point above our heads) very close to the centre of our galaxy, the Milky Way. It can be identified with the naked eye in the night sky between the constellation of Libra, to the west, and that of Sagittarius, to the east. The constellation of Scorpio is one of the twelve zodiac constellations. The constellations of the zodiac are groups of stars that are found in the ecliptic, which is the path that the Sun travels throughout the year. In the same way, both the Moon and the visible planets of the solar system also travel paths in the sky. These trajectories are in an area called the zodiac belt that covers a width that measures 8 to 9 degrees north to south in the ecliptic. The Zodiac Signs normally used in Astrology were created in 134 BC. by Hipparchus who was inspired by a very old system with Babylonian roots that in their turn have learned it from the Sumerians, who lived in 3000 BC. In this system, the Zodiac belt was divided into 12 equal parts, each individual region having a constellation or ruling sign that occupied about 30° in the sky. These constellations have as a common denominator to mark the birthplace of the Sun at each time of the year. Currently, the signs and their original constellations do not correspond, essentially due to the phenomenon of the precession of the equinoxes where the axis of the Earth undergoes a gradual change of its orientation, in a cycle that lasts approximately 26,000 years to return to its initial point.